For many people, the idea of driving a car powered by a battery seems a little risky. While the traditional gasoline and diesel powered vehicle can travel hundreds of miles before requiring a quick stop at a gas station, electric vehicles (EVs) typically need to be recharged every 80 to 200 miles depending on the model and driving conditions. For commuters and road-trippers, EVs don’t always seem like a practical choice. Yet EVs are an important part of Washington’s efforts to electrify the state’s transportation system and reduce greenhouse gas emissions. There were about 8,000 electric vehicles registered in Washington in 2013, and Gov. Jay Inslee has set a goal of increasing that number to 50,000 by 2020. 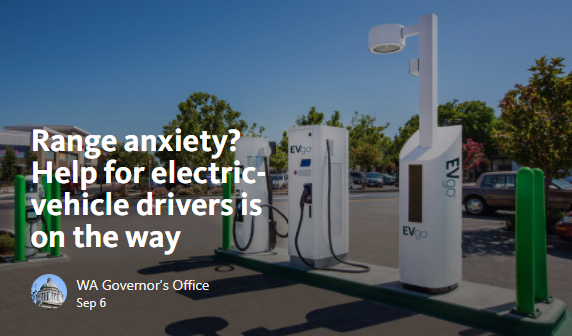 The state has launched numerous efforts to help expand and promote the purchase and use of electric vehicles, and is also working to ensure more fast-charging stations are available along major commuter and travel corridors to keep EV drivers moving conveniently and reliably. The latest effort comes from the Washington State Department of Transportation, which is awarding $1 million in grants to install electric vehicle fast-charging stations along some of the state’s most traveled freeways by June 2019. The new stations will ensure that EV drivers won’t go more than 30 to 50 miles on those roads without finding a public charging station. The 15 new charging stations will be built at retail locations along Interstate 5 between Everett and Chehalis, as well as along Interstate 82, Interstate 182, U.S. Route 395 and Interstate 90 to connect the Tri-Cities to the state’s highway network of chargers.